Backed by predictions as to the alleged negative consequences for the UK of leaving the EU (Dhingra et al. 2016, HM Treasury 2016), the outcome of the Brexit referendum came as a shock to most academic and policy experts, as documented in Los et al. (2017), Brakman et al. (2017) or Baldwin (2016), among others. A very prominent fault line is present in a geographical sense, (see Figure 1). For the 380 local authority districts in the UK, Becker et al. (2017) conclude that a district’s Brexit vote share can be explained by a region’s profile in terms of its age, education, or (former) dependence on manufacturing. Regional differences in immigration and the impact of fiscal policy also appeared to play a significant role. 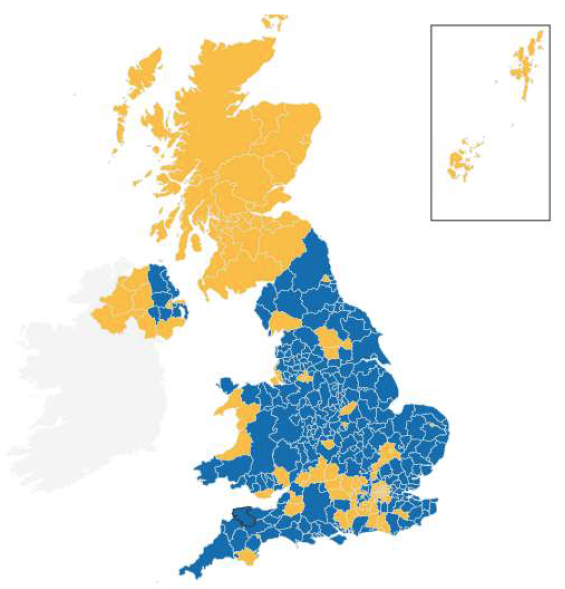 Note: blue= local authority districts with Leave majority; orange= local authority districts with Remain majority. Remarkably, many UK districts that are strongly intertwined with the EU voted for ‘Leave’. The outcome of this referendum seems exemplary of a more general, spatially clustered backlash against economic integration or globalisation, also labelled the ‘geography of discontent’ (Los et al. 2017). In order to explain the paradoxical result whereby regions seem to vote against their (own) economic ‘interests’, and while not discarding any of the above mentioned drivers of the Brexit vote, we argue that what is lacking is a psychological perspective (in line with suggestions by Kaufmann 2016 or Krueger 2016). Following the recent research on ‘geographical psychology’ (Rentfrow et al. 2008, 2015), where it is shown that regional personality traits are associated with a range of regional socioeconomic indicators, in a recent paper we investigate the relevance of regional personality traits for the Brexit vote (Garretsen et al. 2018). Research shows that an individual’s personality traits are a strong predictor of individual political preferences. In the psychological literature, these traits are referred to as the ‘Big Five’: openness, conscientiousness, extraversion, agreeableness, and neuroticism (John and Srivastava 1999, John et al. 2008). When it comes to voting outcomes, there is clear evidence indicating that individual personality traits matter for individual political attitudes and outcomes (Gerber et al. 2011). It has been found that openness is strongly positively associated with liberal attitudes and corresponding voting patterns, whereas conscientiousness is associated with conservative attitudes and voting outcomes (Gerber et al. 2012). Crucially, not only do personality traits explain individual voting behavior, but research also shows that individual personality traits tend to be regionally clustered (Rentfrow et al. 2015). This offers a potential explanation for the above-mentioned regional differences in the Brexit referendum (see again Figure 1). The mechanism that is of particular relevance to understanding regional voting behaviour is the role of social influence, which implies that a region’s long-standing social traditions and practices gradually shape social norms, which in turn affect people’s personality traits (Rentfrow et al. 2015). There is strong evidence that variations in these personality traits across regions are associated with a wide array of regional economic indicators (Garretsen et al. 2017). We hypothesise that openness, in particular, will be a relevant personality trait for explaining the dispersion of the regional Brexit outcomes, as has been first suggested by Krueger (2016) after Bastian Jaeger and following Gerber et al. (2011). The case of Brexit in itself is an example how the external environment (here, EU integration) impacts a region, and whether this is seen as an opportunity or a threat. This is precisely what is at the heart of the openness trait, which measures how conventional and traditional people are in their outlook. Low scores on openness indicate a more inward-looking attitude and a preference for familiar routines instead of new experiences, and vice versa for high scores on openness. Our main findings are summarised via the ‘goodness of fit’ in Figure 3, as measured by the R2, for three models where the local authority district’s ‘Remain’ vote share is the dependent variable. When we only include district scores for openness as a determinant of the regional Remain vote, the first model in Figure 3 below, R2 = 0.453, which implies that almost half of the regional variation in the Brexit vote can be explained by the regional variation in openness. See also Figure 2 where we plot for each local authority district the openness score against the district’s Remain vote share. Figure 2 already illustrates that openness is, of course, not the only determinant of the regional Brexit vote, see for instance the Scottish local authority districts (relatively low on openness but high on the Remain vote share). In the second model, all of the Big Five variables are included to determine the Remain vote; the R2 is now up to 0.643. For the full model (R2=0.891), and in line with Becker et al. (2017), we find that the Remain vote was significantly higher in local authority districts that are Scottish, larger, younger, better educated, and/or with a lower proportion of immigrants. In economic terms, we also find that districts with more manufacturing employment show a lower Remain vote. Most importantly, three of the Big Five variables – agreeableness, conscientiousness and, clearly too, openness – continue to have a strongly significant impact on the regional Remain vote. Note: Goodness of fit as measured by R2 on the vertical axis. Looking again at the full model, the effect size of openness variable is such that a one standard deviation change in regional openness would result in a 1.61% higher Remain vote share. These effects are relevant to understanding the regional dispersion of the Brexit vote. To see this for openness, note that if the least ‘open’ local authority district (Maldon) were to increase its openness to that of the most ‘open’ open (Hackney), it would have had almost a 12% higher Remain vote. In fact, if we look at standardised coefficients for all of the 13 independent variables at the local authority district level in our full model, openness is ranked fourth after higher education, median age, and the Scotland dummy. Our results add a psychological perspective in explaining the regional Brexit vote. In particular, we find that openness is the personality trait that matters most. Our findings are in line with Lee et al. (2018), who find that more residentially mobile people tended to vote more for Remain. Moreover, the relevance of psychological openness could solve the puzzle that UK districts with a higher EU trade openness predominantly voted for Leave (Los et al. 2017) to the extent that UK districts that depend relatively more on EU trade have a lower score in psychological openness. Clearly, regionally clustered personality factors throw additional light on the ‘geography of discontent’ (Los et al. 2017). More generally, this type of analysis may also offer an additional explanation for the rise in resistance against globalisation. In this sense, our findings also contribute to a wider literature that explains how globalisation may be driving regional differences in voting behaviour (Colantone and Stanig 2016, Autor et al. 2016). When it comes to policy implications, openness of voters (like all personality traits) is a rather stable individual trait, and generally is not malleable by election or referenda campaigns. Even though personality traits are quite stable, they are obviously not fixed (see Stuetzer et al. 2016 for the UK regions). Research shows that personality traits can change, especially at a young age, and that this change is partly attributable to social demands and experiences (Almlund et al. 2011). More specifically, investing in the development of personality skills can even be more effective than the more commonly used investments in the cognitive skills of human capital. A concerted policy effort to affect a region’s personality traits can thus also affect a region’s growth and prosperity over time. In addition, regions that have fared less well economically are also likely to have inculcated and reproduced less open attitudes and personality traits over time. Such attitudes and traits may eventually – as in the case of Brexit – find expression in major political opposition or protest (see also Rodríguez-Pose 2018). This would also seem to be a key issue for the growing debate surrounding the uneven geographical impact and polarised social responses to the benefits and costs of globalisation. Almlund M, A L Duckworth, J J Heckman and T D Kautz (2011), “Personality psychology and economics”, NBER Working Paper No. 16822. Autor D, D Dorn, G Hanson and K Majlesi (2016), “A Note on the Effect of Rising Trade Exposure on the 2016 Presidential Election”, mimeo, MIT. Baldwin, R E (ed) (2016), Brexit Beckons: Thinking ahead by Leading Economists, CEPR Press. Becker S, T Fetzer and D Novy (2017), “Who voted for Brexit? A comprehensive district-level analysis”, Economic Policy 32(92): 601–650 (summarised on VoxEU). Brakman, S, H Garretsen, and T Kohl (2017), “Consequences of Brexit and Options for a ‘Global Britain”, CESifo Working Paper No. 6448, forthcoming in Papers in Regional Science (summarised on VoxEU). Colantone, I and P Stanig (2016), “Global Competition and Brexit”, BAFFI CAREFIN Centre Research Paper, No. 2016-44. Curtice, J (2017), “Why Leave Won the UK’s EU Referendum", Journal of Common Market Studies, 55 (S1): 19-37. Dhingra S, H Huang, G Ottaviano, J Pessoa, T Sampson and J Van Reenen (2016), “The costs and benefits of leaving the EU”, Centre for Economic Performance (summarised on VoxEU). Garretsen H, J I Stoker, D Soudis, R L Martin and P J Rentfrow (2017), “The relevance of personality traits for economic geography: making space for psychological factors”, mimeo, University of Groningen/University of Cambridge. Garretsen H, J I Stoker, D Soudis, R L Martin and P J Rentfrow (2018), “Brexit and the relevance of regional personality traits: More psychological Openness could have swung the regional vote”, Cambridge Journal of the Regions, Economy and Society. Gerber A S, G A Huber, D Doherty and C M Dowling (2011), “The big five personality traits in the political arena”, Annual Review of Political Science 14: 265-287. Gerber A S, G A Huber, D Doherty and C M Dowling (2012), “Personality and the strength and direction of partisan identification”, Political Behavior 34(4): 653-688. HM Treasury (2016) "The long-term economic impact of EU membership and the alternatives". John, O P and S Srivastava (1999), “The Big Five trait taxonomy: History, measurement, and theoretical perspectives”, Handbook of personality: Theory and research 2: 102-138. John O P, L P Naumann and C J Soto (2008), “Paradigm shift to the integrative big five trait taxonomy”, Handbook of Personality: Theory and Research, 3: 114-158. Kaufmann, E (2016), “It’s not the economy, stupid: Brexit as a story of personal Values”, LSE Blog. Krueger, J I (2016), “The Personality of Brexit Voters: Openness Predicts Best”, Psychology Today blog (after Bastian Jaeger). Lee, N, K Morris and T Kemeny (2018), “Immobility and the Brexit vote”, Cambridge Journal of the Regions, Economy and Society. Los, B, P McCann, J Springford and M and Thissen (2017), “The Mismatch between Local Voting and the Local Economic Consequences of Brexit”, Regional Studies 51(5): 786-800. Rentfrow, P J, S D Gosling and J Potter (2008), “A theory of the emergence, persistence, and expression of geographic variation in psychological characteristics”, Perspectives on Psychological Science 3: 339–369. Rentfrow, P J, M Jokela and M E Lamb (2015), “Regional personality differences in Great Britain”, PLOS ONE, 10(3): e0122245. Rodríguez-Pose, A (2018), “The revenge of the places that don’t matter”, VoxEU.org, 6 February. Stuetzer, M, M Obschonka, D B Audretsch, M Wyrwich, P J Rentfrow, M Coombes, L Shaw-Taylor and M Satchell (2016), “Industry structure, culture, and entrepreneurship. An empirical assessment using historical coalfields”, European Economic Review, 86: 52-72. For exact definitions, see Becker et al. (2017); data sources: https://www.ons.gov.uk/ and http://freigeist.devmag.net/) .